“No. Between the two of us, I think we have managed to cover them all.” he mumbled as that uncomfortable lump in his gut returned. He glanced around again and back down into his glass. “Are you quite sure? It is an ugly story, especially considering the occasion.” He looked up into her eyes, causing her breath to catch in her throat. He paused, and Ruth struggled to contain her urge to rush him on. She could tell by the look in his eyes that he was lost in memory. “We were well received in the beginning. We tried to learn their ways, their words, and their myths. We lived in their lodges, shared their work, spoke their tongue, and ate their food. Once we could understand how they thought and behaved, we could use that knowledge to adapt the Gospel to something they could understand. At least that was the plan. “The Hurons, among whom we lived, were a fascinating, if savage, people. And our mission seemed to be moving forward as predicted...” He looked away as his jaw tightened. “Then what happened?” she urged. Ruth glanced over at him, and he gave her a nod. “I think so. We’d like to start with your appetizer sampler. Then I would like tonight’s special, with the soup. Thank you.” Biting her lip, she hoped she not ordered too much. She did not want Julien to assume she was taking advantage of his generosity. “I will take the same.” He smiled politely. “One day like any other day, in 1642, while I was assisting in gathering materials for one of the shelters, I was taken captive by a group of Iroquois warriors.” Again, he paused, using his wine glass as an excuse to stop the story. “And?” She knew her eyes were wide with anticipation. “And...It is an experience I have tried for a long time to forget.” He trailed off. “Oh, forgive me. I don’t mean to be insensitive.” Feeling her face start to flush, she took a drink of her wine and stared into the glass in silence. “My pleasure.” She smiled and left. Meanwhile, Ruth picked at the food as she sneaked a glance across the table. “The tortures went on for hours. Beatings and whippings and burns... threats with arrows through my heart and scalping. When I asked why, they told me, ‘because the Devil made them do it!’” He laughed. The waitress interrupted with another bottle of wine. “Thank you,” they replied in unison and she left the open bottle on the table after refilling both their glasses. “Oh?” She couldn’t help but be curious at this point, despite the horridness of what she had heard. “Tawiskala. She was at once beautiful and frightening. I was not sure whether to scream or cry or beg for mercy.” He glanced around the room several times before he leaned in closer as his voice lowered. “‘To honor God,’ I replied. “‘Tell me, Black Robe, do you fear death?’ she whispered in my ear, causing me to shiver. “‘No. I have the promise of eternal life should I be deemed worthy,’ I remember saying. “‘But needlessly.’ She pulled the stakes from my feet, causing me to cry out. “‘This is nothing more than a test. I will not give in to your temptation, She-Devil.’ She dug her claws into my wounds, causing me to struggle against her, but it was useless. Next, she licked away my tears as she laughed. The sound made me vomit.” He stared into his wine glass. Holding her breath, Ruth waited for him to continue. She almost cried out in surprise when their waitress reappeared with their dinner plates. “No, we’re fine,” Julien responded. His eyes followed the waitress as she left them. “Then her cold touch relieved my pain. Her kisses healed my wounds and...” His lips tightened into a frown. “And then..” He looked away from her as his fists clenched beside his glass. “...Eventually, she drank.” He reached up to his own neck as his eyes closed. He looked at her again, his pale eyes still distant. “Until my body went numb and my vision went dark. I thought I was dead. I felt myself praying for forgiveness as I hoped it would end soon.” He took a large gulp from his glass. Covering her mouth with her hand, Ruth’s eyes widened. “When I opened my eyes the next evening, I could think of only one thing.” His eyes shot open, and he stared straight through her. “Tawiskala was prepared. One of the Iroquois warriors lay bound nearby.” He frowned. “It disgusted and thrilled me, how easily I was able to end that life. And once he had nothing left to give, I set off in search of more. Six people died by my hand that first night alone.” He emptied the bottle into his glass. “I can still remember it like it was last night. Each face. Each scream.” Lifting his glass, he took another deep sip. “But enough about that.” He finished his wine in one long gulp. “Let us enjoy this lovely meal. Shall we?” He smiled at her, although his eyes lacked the same enthusiasm. Jo Bissell started writing in middle school with fantasy stories inspired by books such as The Hobbit, and in fact once turned in a journal project written entirely in Dwarfish Ruins. 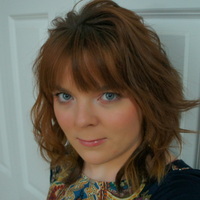 She then explored fanfiction and short speculative fiction writing. Now, after many years of study, she spends most of her time working as a full time physician caring for hospitalized adults. When she is not writing or doctoring, she enjoys reading, watching movies, traveling, archery, thrift store shopping, and snowboarding. She currently resides in the Iowa City, IA area with her husband and two cats. 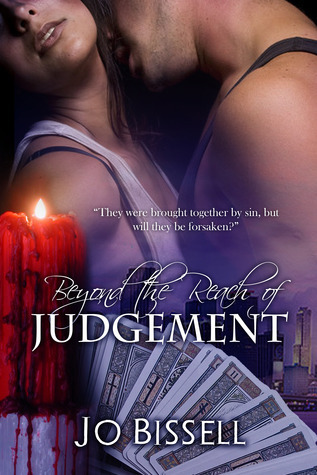 Beyond the Reach of Judgement is Jo Bissell’s first original novel which evolved out of a 2012 National Novel Writing Month (NaNoWriMo) project. She also has a short speculative fiction piece, His Eyes, available for Kindle. Future planned novels include a sequel to Beyond the Reach of Judgement, other works of urban fantasy and paranormal romances, and a science fiction novel. She continues to participate in NaNoWriMo. That was quite the excerpt. I need to know more about it. Great excerpt definitely adding this to my TBR! This book is a bit different. I haven't came across a paranormal tragedy for some time how. Make me curious enough to read it.